Home Tour Tickets Now On Sale! 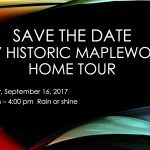 The Historic Maplewood Home Tour page has been updated with details for the Saturday, Sept 17th event! Swing on over to the Home Tour page for details! The Maplewood Neighborhood Association will be back in September 17, 2016. Check out the MNA Website for updates. Like us on our Facebook page: Maplewood Home Tour. 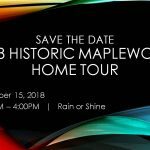 Thanks for the successful Historic Home Tour, Maplewood! With more than 300 visitors to the houses, along with music and arts on the mall, this Home Tour was definitely a success. Thanks for your efforts, Maplewood!